MUSIC SWEET & SERIOUS. Heinrich SCHEIDEMANN: Præambulum in G, WV 73; Gelobet seist du, Jesu Christ, WV 60; Canzon in G, WV 74; Præambulum in F, WV 39; Vom Himmel hoch da komm ich her, WV 69; Lobet den Herren, denn er ist so freundlich, WV 13; Jesu, wollst uns weisen, WV 78; Christ lag in Todesbanden, WV 3; O Gott, wir danken deiner Güt, WV 22; In dich hab’ ich gehoffet, Herr, WV 8; Dic nobis, Maria, WV 51; Toccata in G, WV 43. Jacob PRÆTORIUS II: Wan kann uns kommen an für Not; Vater unser in Himmelreich; Præludium in F; Magnificat primi toni (5 verses). Improvisations: A demonstration of the stops of the organ. 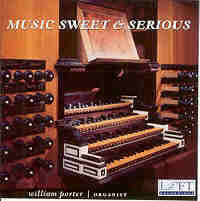 William Porter (North German Organ, Örgryte nya kyrka, Göteborg, Sweden). LOFT LRCD 1050/51 (2 CDs, 71:11 + 60:40) (http://www.loft.cc/). Also available at ArkivMusic. The two most illustrious Hamburg pupils of Jan Pieterszoon Sweelinck share these dazzling demonstration CDs of the amazing variety of colors of the North German Hanseatic organ in the Örgryte nya kyrka at Göteborg. Here’s the perfect introduction to the dynastic and interconnected world of German organists. The Hamburg City Council not only owned the organs but also employed the organists. This check kept musical establishments out of the control of petty religious bureaucrats and preserved the organs from fundamentalist vandals. Heinrich Scheidemann’s father, David, was organist at the Catherinenkirche. Young Heinrich succeeded his father there and in turn taught and was followed by Jan Adam Reincken, who held the post from 1663 until 1722, when he was cut down just short of his 100th birthday! Reincken was also a musical buddy of Dietrich Buxtehude. Jacob Prætorius II (né Schultz, 1586-1651) was the grandson of Jacob Prætorius I, who was organist at Hamburg’s Jacobikirche. Hieronymus Prætorius, son of Jacob I, followed his father as organist at the Jacobikirche. Hieronymus’ son, Jacob II, assumed duties at Hamburg’s Petrikirche. Heinrich Schütz sent his favorite pupil and deputy, Matthias Weckmann, from Dresden to study with Jacob II. Later, Weckmann won the post of organist at the Jacobikirche. The best man at Weckmann’s wedding was none other than Franz Tunder, father-in-law and predecessor of Dietrich Buxtehude in Lübeck. So you see what I mean about interconnections. The Hamburg Town Council paid to send both young Heinrich Scheidemann and Jacob Prætorius II to Amsterdam to study with Meijster Jan Sweelinck, organist at the Oude Kerk and colleague of Dr. John Bull and Peter Philips, both outstanding keyboard virtuosi. In his informative notes, Prof. Porter quotes from Johann Kortkamp, a pupil of Jacob Prætorius II and Weckmann, about the playing style of both Prætorius and Scheidemann. Porter also employs Kortkamp’s description of Jacob’s registration in the recording, using the Zinck (cornet) stop to play the chorale melody. Porter rightly contrasts the melodic, sunny style of Scheidemann (c. 1591-1663) with the more severe, serious manner of Prætorius II. It’s no accident that more manuscripts of Scheidemann’s music come down to us in more sources than all of his contemporaries put together. Porter gives us two of Scheidemann’s Præambula and one Toccata in the Sweelinck style, complete with echo effects and chromatic progressions made even more pungent by the mean-tone tuning of the Örgryte organ. Impressive but never ponderous. He also includes one example of Scheidemann’s famous intabulations (transcriptions), Dic nobis, Maria. These compositions are worthwhile in their own right and were possibly played in place of the choir. Porter really shows his mastery of the long, singing melody in the various chorale-based fantasias of both Scheidemann and Prætorius. The underlying chorale theme never gets lost in the surrounding contrapuntal underbrush. We must not slight the delightful miniatures Prof. Porter improvised to illustrate all the various colors and divisions of the organ. It’s to the lasting credit of the designers, builders, voicers and Roger Sherman’s miking technique that the soft, low pipes of the pedal retain both their pitch definition and timbre all the way down. Too many organ recordings deliver a blurry rumble in the bass notes. I must also compliment Sherman’s staff for complete and comprehensive notes on the composers, their music, the organ and the technique of its recording. Hearing both Hamburg masters on a large, authentic organ in an expansive acoustic has really spoiled me. This release is an impressive accomplishment and not to be missed! FRENCH SYMPHONIC MASTERPIECES. Alexandre GUILMANT: Introduction, Pastorale from 1re Sonata, Op. 42. César FRANCK: Prière, Op. 20. Charles-Marie WIDOR: Allegro, Adagio from Symphonie VI, Op. 42. Jehan ALAIN: Intermezzo. Maurice DURUFLÉ: Suite, Op. 5. Hans Davidsson (Verschueren organ , Göteborg, Sweden). LOFT LRCD 1054 (79:31) (http://www.loft.cc/). Also available at ArkivMusic. In commissioning an organ for a new recital hall at Göteborg University, Prof. Davidsson and colleagues wisely decided against a modern, jack-of-all-trades instrument in favor of a French symphonic organ modeled after the recital-hall instruments by Aristide Cavaillé-Coll. Built by the Dutch firm of Verschueren with extensive experience renovating 19th-century Cavaillé-Colls, its three-manual console is reminiscent of the organ Franck played at Ste.-Clothilde, right down to the round iron levers above the pedalboard. These release ventils admit air at the touch of a toe to previously-drawn stops and are the antecedents of modern toe pistons which electrically enable pre-set stops, unfortunately with a thud totally out of place in the pre-electric period. The organ is equipped with the Barker-lever pneumatic assist on the Grand Orgue and has the Récit and Positif divisions enclosed in venetian-blind swell shutters. A concession to modernity is an electric blower for the bellows. Organ stops which imitate wind instruments started as early as the Renaissance with the Zinck (cornet), Posaune (trombone), Trommet (trumpet), Cromorne (krumhorn) and not-to-be-forgotten Hobo. Nineteenth-century organ designers updated the types of instruments and added strings. Best-known for his interpretations of early 17th-century composers, Prof. Davidsson proves that he’s equally adept in the more standard repertoire. The Guilmant selections have the requisite uptempo swagger. Franck’s Prière could easily teeter on the edge of bathos. Davidsson resists sentimentality by showing off the delicate flute stops of the Positif. 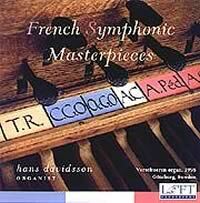 The finger-busting Widor showpieces not only demonstrate Davidsson’s skill but also the sonorous French reed stops. In the concluding pieces by Duruflé and his pupil Jehan Alain, Davidsson gives us a really poignant expression of Gregorian-tinged fervor. I have never heard a more compelling rendition. Erik Sikkema’s superb recording rounds out a top production, ably assisted by Anna Frisk of GoART. Congratulations to all! Ordering: Luckily my neighborhood CD emporium stocks these Loft releases. If yours doesn’t, you can order from the label website or from http://www.gothicrecords.com/. European orders would probably reach you quicker from ever-reliable GoART: http://www.goart.gu.se. 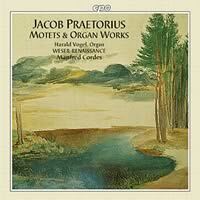 Jacob PRÆTORIUS II: Motets, Organ Music. (Præambulum in d for organ; 7 verses on Vater unser in Himmelreich; Veni in hortum meum; Surge propera ; Sponse musarum; Indica mihi; Vidi speciosa; Quis novus hic oritur; Quam pulchra es; Gaudete omnes; Forti anima esto; Instrumental Galliard à 5 .) Harald Vogel (organ), Weser Renaissance (Manfred Cordes, cond.). cpo 999 215-2 (63:27) (http://www.cpo.de/). Also available at ArkivMusic. In the only other extant CD I know of incorporating the music of Jacob Prætorius II, we get a very instructive comparison. Here Harald Vogel plays the identical Vater unser verses Prof. Porter did at Göteborg. Vogel’s instrument is a mean-tone organ built by Edo Evers in 1616-1618 at the Warnfried Lutheran Church in Ostseel, the second-oldest instrument in East Frisia. Both organists use almost identical tempi and registrations with the same meticulous attention to phrasing in the long melodic lines. The only differences are the organs and the recordings. Because it lacks an independent pedal division (pedal notes are pulled down from the manuals), the Evers organ comes out distinctly on the puny side. This is especially evident in the last verse where the 32-foot pedal Posaune at Göteborg carries the chorale melody with impressive gravitas, as befits the sober-sided Prætorius. Also, Roger Sherman’s cutting-edge, 24-bit recording technology adds more presence than the obviously 16-bit DAT taping on the cpo CD. The wedding motets show us a completely different side of old Jacob. The blatant eroticism of the Song of.Songs was not lost on the lusty Hamburgers, except for Nigra sum sed formosa. Here the performance of solo voices and chamber instruments follows the Hochzeitsordnung (wedding regulations) of 1607 allowing four instruments and possibly a violin playing with the organ. Aside from the usual Teutonic attempt to regulate almost everything, the rules were a democratic attempt to restrain excessive display on the part of the wealthier families. The music itself was often printed and presented to the lucky couple as a wedding present. It should be noted that all these texts are in Latin, as befits the language of learning up to the middle of the 18th century. Interestingly, most of the instrumentation followed here has a distinctively Venetian quality with heavy emphasis on the cornets and trombones. The Gabrieli style of choral and brass writing survived in Germany right up until the middle of the 17th century. Even though the musical style is Venetian, the performance recorded here is decidedly Germanic. It’s debatable whether the original renditions were as doggedly foursquare as what we get here, but it’s also possible that much of the Eye-talian lilt got lost in its translation to Hamburg. 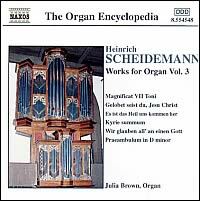 Heinrich SCHEIDEMANN: Works for Organ, Vol. 1. (Præludium in D minor, WV 34; Dic nobis Maria (after Bassano); Magnificat VI Toni, Ballet; Erbarm dich mein, O Herre gott; Toccata in G, WV 43; Paduana Lachrymae (after Dowland); Surrexit pastor bonus (after Lassus); Jesus Christus unser Heiland (Chorale Fantasia); Vater unser in Himmelreich I; Præambulum in C, WV 72.) Pieter van Dijk (Van Hagerbeer / Schnitger organ, St. Laurenskerk, Alkmaar, Holland). NAXOS 8.554202 (78:40) (http://www.naxos.com/naxos/usa/naxos_usa.htm). Also available at ArkivMusic. As a recitalist, author, broadcaster and organizer of the complete keyboard works of Sweelinck in a groundbreaking nine-CD set for Radio Netherlands (NM Classics 91129, available from http://secure.mdt.co.uk/), Pieter van Dijk gives us a varied sample of all the forms Scheidemann used. The 1645 van Hagerbeer organ is the famous one Helmut Walcha used in his complete traversal of the J.S. Bach organ works. Its 22-foot pedal Prestant stop provides the requisite weighty underpinning. In 1725, Franz Caspar Schnitger added a set of German reed stops and shimmery, narrow-scale mixtures to the Rückpositiv. He may have also changed the tuning to equal temperament. The latest refurbishing by Flentrop has returned the pitch to its original A-415. This change from mean-tone to equal-tempered tuning dulls some of the bite of the continual chromatic key changes in the Præludium in D minor, but it’s currently the only game in town. A Præambulum in C also reflects the improvisatory nature of the form. Two intabulations (transcriptions) of vocal works show Scheidemann’s lyrical gifts. Unfortunately, van Dijk’s interpretations remain competent but earthbound. The Chorale Fantasia Jesus Christus, unser Heiland shows off the kind of architectural polyphony employed by Hamburg organists at the Saturday Vespers service. Chorale preludes and verses for the Magnificat also represent the liturgical repertoire. 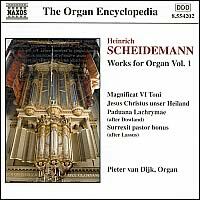 So here we have a virtually contemporary organ to Scheidemann’s in a sample of the major forms he employed, all at a bargain price. And we must be grateful to Naxos for keeping all their releases in stock. 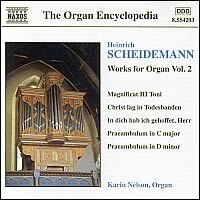 Heinrich SCHEIDEMANN: Works for Organ, Vol. 2. (Præambulum in C, WV 30; Lobet den Herren, denn er ist sehr freundlich; Komm, heiliger Geist; Fantasia in G, WV 86; Es spricht der Unweisen Mund wohl (4 verses); Fuga, WV 84; Magnificat III Toni (4 verses); O lux beata trinitas (2 verses); Toccata in C, WV 85; Christ lag in Todesbanden (3 verses); Alleluja, laudem dicite deo nostro (Haßler); In dich hab ich gehoffet, Herr; Præludium in D minor, WV 33.) Karin Nelson (Brombaugh organ , Haga kyrka, Göteborg, Sweden). NAXOS 8.554203 (75:51) (http://www.naxos.com/naxos/usa/naxos_usa.htm). Also available at ArkivMusic. Göteborg’s own (with a detour to the Sweelinck Institute in Amsterdam) Karin Nelson has the friskiest lyricism of all the organists in this survey. It nicely befits Scheidemann’s sunny cheerfulness. As the regular organist at the Haga kyrka, she also brings off the difficult task of making the modest, mean-tone organ sound like a much bigger instrument in all its changes of tonal colors. The Præambulum, Præludium and first verse of Christ lag in Todesbanden show off the full complement of flue principals, mixtures and reed stops sounding together. Other selections use consort registrations of individual stops which fit the liturgical nature of most of the compositions. Ms. Nelson shows a rare sensitivity to the subtle cross rhythms and syncopations which make this music so refreshingly surprising. Like Prof. Porter, she is equally adept at keeping the forward momentum going through long, chromatic, florid lines. Not only does she make her instrument sing, she somehow manages to bring out the Venetian background inherent in a number of the harmonies. Let’s hope some enterprising producer will seat Ms. Nelson at the console of the large Örgryte nya kyrka organ at Göteborg for a two-CD album of Scheidemann. Heinrich SCHEIDEMANN: Works for Organ, Vol. 3. (Præambulam in D minor, WV 36; Kyrie summum; Verbum caro factum est (Haßler); Jesus Christus, unser Heiland II (5 variations); Est ist das Heil uns kommen her’; Canzona in G; Gelobet seist du, Jesu Christ; Gott sei gelobet und gebenedeiet; Herzlich Lieb hab ich dich, o Herr; Magnificat VII Toni; Jesu, wollst uns weisen; Vater unser im Himmelreich III; Præambulum in F, WV 39; Ego sum panis vivus (Lassus); Wir glauben all’ an einen Gott; Præambulum in D minor, WV 32.) Julia Brown (Brombaugh organ , Central Lutheran Church, Eugene, Oregon). NAXOS 8.554548 (72:05) (http://www.naxos.com/naxos/usa/naxos_usa.htm). Also available at ArkivMusic. Compared to the Haga kyrka organ, this Brombaugh instrument is a more imposing, mean-tone, three-manual organ closer to the size of the one available to Scheidemann. With no thanks to the reverberation in the church, which is dead as a smelt, Dr. Brown emphasizes the vocal qualities of Scheidemann even more than Prof. Porter as a triumph of phrasing over acoustics. It’s important to remember that in the early 17th century, keyboard writing was not so far removed from vocal style as it was at the end of the century. What Scheidemann got from Sweelinck was Netherlandish vocal counterpoint combined with digital keyboard virtuosity and flash as exemplified by the works of Dr. John Bull, Sweelinck’s contemporary in Antwerp. Following the registration recommendations of Mattheson and Kortkamp, Brown frequently plays the naked chorale melody in the pedal with its more florid, ornamented version juxtaposed with a solo stop on one manual. We get a double vision of the tune simultaneously. Overall, Scheidemann uses keyboard virtuosity to serve the melody rather than the organist’s skill. All the selections here were composed for Lutheran liturgical use and are chorale-based, except for the Præambula. At a bargain price, Scheidemann can come sing for you! BAROKE ORGELMUSIK AUS NORDDEUTSCHLAND. Matthias WECKMANN: Præambulum Primi Toni; Ach wir armen Sünder. Dietrich BUXTEHUDE: Præludium in E, BuxWV 141; Ciacona in e, BuxWV 160; Nun bitten wir den heiligen Geist, BuxWV 209. Heinrich SCHEIDEMANN: Galliarda ex D; Paduana Lachrymae. Johann Adam REINCKEN: Choralfantasie: An Wasserflüssen Babylon. Mario Hospach-Martini, Christian Müller (organ , Leeuwarden). ARTE NOVA 74321 92044 2 (62:14) (http://www.artenova.de/). Apart from completely routine performances of Weckmann, Buxtehude and Scheidemann, the reason for including this CD is that it’s the only modern recording of the Reincken An Wasserflüssen Babylon. Reincken was a pupil of Scheidemann, then his deputy and finally his successor in 1663, presiding over the Catherinenkirche instrument until 1722, just short of his 100th birthday. Here Reincken follows Scheidemann in breaking up the chorale into episodes, giving us varied pictures of the range of organ divisions, echo effects and winding up with a virtuosic, Stylus Phantasticus finale – a 20-minute tour-de-force. It’s for you to decide if having the only Reincken organ piece is worth even the bargain price of this Arte Nova CD. THE SWEELINCK SCHOOL OF GERMAN ORGANISTS. Jan Pieterszoon SWEELINCK: Hexachord Fantasia; Allein Gott in der Höh’ sei Ehr’; Capriccio. Jacob PRÆTORIUS II: Christum wir sollen loben schon. Heinrich SCHEIDEMANN: Toccata in G. Samuel SCHEIDT: Christ lag in Todesbanden. Melchior SCHILDT: Magnificat Primi Toni. Elizabeth Harrison (organ). RAVEN OAR 540 (70:58) (https://www.ravencd.com/merchantmanager/index.php). Also available at ArkivMusic. Dr. Harrison plays the Fisk-Nanney organ at the Memorial Church at Stanford University, a four-manual instrument than can be played either in mean-tone or equal-temperament tuning. For this recital I presume she uses the mean-tone — prevalent at the time and suitably pungent in chromatic progressions. 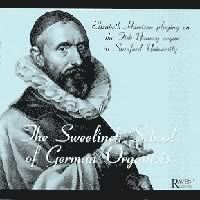 As well as being called “the Orpheus of Amsterdam,” Meijster Jan Pieterszoon Sweelinck was the teacher of a whole generation of young German organists, some the sons of Hamburg organists whose tuition was paid by the City Council. Although Sweelinck printed many of his vocal works both in French and Latin, he never published any of his keyboard works for which he was so justly famous. What has come down to us in manuscript are either copies made by his students or compositions written by Sweelinck for student study. The Hexachord Fantasia is a consummate example of Sweelinck applying Netherlandish vocal polyphony to the keyboard. He may well have played this at the Oude Kerk (formerly the Cathedral of St. Nicholas) either before or after a service or during one of his noontime recitals. Calvinist authorities prohibited organ playing during the church services themselves and probably would have destroyed the organs as well, except that the organs belonged to the City Council. The council wasn’t about to have valuable property trashed by religious hooliganism. And the organist was also a city employee, not the church’s. Allein Gott in der Höh’ sei Ehr’ is a set of variations on the German chorale. The first four are credited to Sweelinck and they are followed by others possibly by Scheidt, Scheidemann or other students. This is most probably a teaching example for his pupils. The Capriccio is a secular piece that could as easily be played upon the harpsichord or a virginal. There was as yet no separation of instrumental styles, even to the extent of requiring pedals. Organists routinely practiced at home on pedal harpsichords or even pedal clavichords instead of freezing their butts in unheated churches and paying a kalkant, or pumper. We think we have it tough? Anyhow, this Prætorius was not related to Michael Prætorius (Schultheiß) but was known as “the preacher of music.” His serious and elevated style is very much in evidence in Christum wir sollen loben schon. Heinrich Scheidemann was the son of David Scheidemann, also organist at the Catharinenkriche in Hamburg. Heinrich presided over a magnificent, four-manual instrument. Scheidemann died of the plague in 1663 and was succeeded by Jan Adam Reincken, who continued playing there until the age of 99 in 1722! Scheidemann’s more lyrical temperament shows forth in this sprightly Toccata. 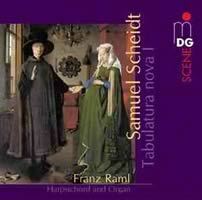 Endlessly inventive, Samuel Scheidt is one of my favorites of the Sweelinck pupils. Fortunately for us, he published several volumes of his Tabulatura Nova before the 30 Years War ripped up central Germany. 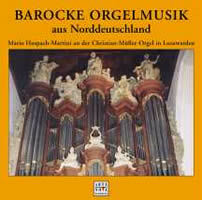 Harald Vogel has just completed a modern edition of all of Scheidt’s organ works. So let’s hope that we’ll see more recordings like this one of Christ lag in Todesbanden. The Sweelinck legacy of complex variations shines through but with a lightness of treatment that is typical of Scheidt. Harrison winds up with Schildt’s Magnificat, probably written to alternate with the choir’s verses sung at Saturday Vespers. Schildt gives us more no-nonsense solemnity similar to Jacob Prætorius II. Dr. Harrison’s sprightly and colorful interpretations provide a very pleasurable and fascinating chance to hear what these famous names actually played. Samuel SCHEIDT: Tabulatura Nova (1624), Vol. 1. (Cantio Sacra: “Wir glauben all an einen Gott.” Fantasia super: “Io son ferito lasso.” Cantio Sacra: “Vater unser im Himmelreich.” Cantio Sacra: “Warum betrübstu dich mein Hertz.” Passamezzo; Niederlandisch Liedgen. Cantio Belgica: “Weh windgen weh.” Curant I; Curant II; Niederlandisch Liedgen. Cantio Belgica: “Ach du feiner Reuter.” Frantzösisch Liedgen. Cantio Gallica: “Est-ce Mars.” Psalm: “Da Jesus an dem Creutze stundt.” Fantasia super “Ich ruffe zu dir Herr Jesu Christ.” ) Franz Raml (Arp Schnitger organ, Lüdingworth; 17th-century South German harpsichord [Bernhard von Tucher]), Christina Landshamer (soprano). MDG 614 1155-2 (2 CDs, 69:53 + 64:10) (http://www.mdg.de/indexeng.htm). Also available at ArkivMusic. Samuel Scheidt (1587-1654) was the most outstanding pupil of Sweelinck. His compositions are uniformly sunny and melodic. In many instances it’s impossible to tell if a work is by Sweelinck himself or an idiomatic imitation of the master’s style by Scheidt, nor need it really matter these days. Mainly we have delightful music to enjoy, regardless of its authorship. Scheidt was also one of the pioneers in liberating organ keyboard music from the confines of improvisation and transcription (intabulation of vocal works). Naturally he encountered one of the crummiest of lives: His job was eliminated by the 30 Years War and his four children died of the plague! He nevertheless stuck it out in Halle until the arrival of better times. Yet I still have a lingering suspicion that both Scheidt and Sweelinck themselves were far more flamboyant and lyrical, nay daring, in their own performances. That said, it’s still nice to have the complete works in one package.